Posted by Shawn Kriewaldt. on Sunday, July 31st, 2016 at 11:32am. As you enter this sophisticated and stylish residence you will immediately be drawn in by the grand foyer, formal staircase, soaring ceilings and 2-story wall of windows overlooking the golf course. The causal yet elegant kitchen furnished with a Wolf cook-top and double ovens, a Sub-Zero refrigerator and a large granite island is an ideal area for entertaining with access to the screen porch with two-sided fireplace, and large patio with sunken hot tub. Two master bedrooms with en-suites and walk-in closets. Your main level master suite highlights a sitting room, gas fireplace, lighted tray ceiling, heated bathroom floors and motion lights, views of the golf course and has access to the executive style office. Your second level has three additional bedrooms each with a full bath and walk-in closet, a den that can be used as a bedroom and built-in book case. Your lower level is perfect for entertaining or family time in the great room and Billiards room with a wet bar furnished with a full-size refrigerator, dishwasher and microwave. There is also an exercise room and large craft room that is currently being used as a bedroom. The large storage room is accessible from the lower level as well as the 3-car garage. Located at 5 Turnwood Circle, Madison on the 15th Hole at Hawks Landing. Many more details - must be seen to appreciate! 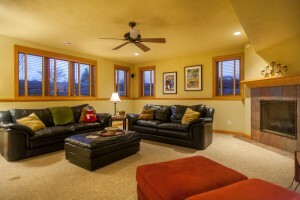 For more details go to 5 Turnwood or call for a private tour of this beautiful home, contact us at 608-212-5743!